It’s been a good few weeks for hip-hop between all of the Jay-Z hullabaloo, Kanye West’s big Yeezus release, and Wale hitting #1 on the album charts. If that’s not enough rap in your life, recent maid-of-honor Jennifer Gabrielli has put together a “musical snack” for those willing and able to understand why wedding speeches and Eminem really do go hand in hand. In the above video, Gabrielli proves she has the balls—and the writing skills—to rework the lyrics to Eminem’s famous track “Without Me.” Instead of “Two trailer park girls go round the outside” it’s “Two lovers in love walk down the aisle, down the aisle, down the aisle.” But the young lady’s rap persona doesn’t stop there. 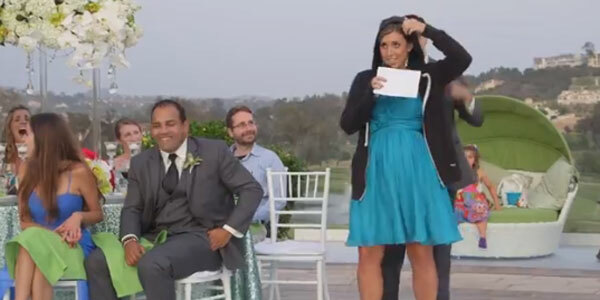 Instead of reworking the whole tune in her blue bridesmaid dress, Gabrielle enlists another wedding party member to help her don a Victoria’s Secret Pink hoodie, which totally reminds me of the time Kelly Clarkson decided to throw a curveball and sing an Eminem cover for her fans. Her version of “Lose Yourself” is a little less cutesy than this one, however. Once she really gets into the rhythm of the song, it’s actually pretty amazing, with the whole chorus devoted to toasting the bride and groom for completing their wedding ceremony (“This looks like it’s meant to be, so everybody just toast with me”). It does get a little long and referency to Gabrielli’s actually relationship with her sister and the groom after that, with the young woman stating she’ll “pop on over” when they least expect it and talking about the couple’s potential to have children, etc. Still, even though we aren’t in the know about the specifics of their relationship, re-workings of Eminem songs at receptions don’t come up all that often. Although, after this rendition, perhaps they should. Clearly, this isn’t the sort of thing that would go over at every wedding party. In fact, Eminem is not usually the sort of music that bridges the gap across several generations, so having the right people on board is key to making a stunt like this work. Regardless, all of the adults in the crowd seem to be digging this version by the song’s end and the video has subsequently attracted well over a million YouTube hits, proving that it’s often worth it to be willing to take chances and put together something memorable for a wedding ceremony. Check out some other unique wedding moments, like Bill Clinton crashing an Irish wedding, as well as the world’s cutest screaming flower girl ever.